A multi-disciplinary artist, Ryan Rasmussen's work serves as meditations on the multifarious aspects of the built environment, primarily spotlighting the visual language of cultural artifacts and popular products. 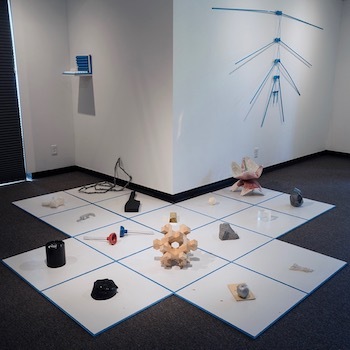 His work takes on many forms, including sculpture, installation, kinetic and electronic works, collaboration, design, 3-D printing and digital fabrication and video. Gleaning the tools of extrapolation and mimicry from literary science fiction, he examines how, together with technology, cultural artifacts simultaneously embody and project desire through an expanding global vernacular. Rasmussen is an assistant professor of sculpture at Georgia State University in Atlanta and holds a Master of Fine Arts in dimesional practice from the University of Iowa. He has exhibited his works nationally and internationally in venues including the Glass Curtain Gallery in Chicago, the Clough Hansen in Memphis, the Nancy Fyfe Cardozier Gallery in Midland-Odessa, Texas, the CICA Museum of South Korea and Mathaf: Arab Museum of Modern Art in Qatar.